Make way for the return of The Muppets, Disney’s attempt at reviving the wacky Jim Henson puppets that have laid dormant for many years. The writers know it too as star Jason Segel helped pen this pet-project of his. His infatuation with the clan is a little more than hinted at in the recent Forgetting Sarah Marshall. 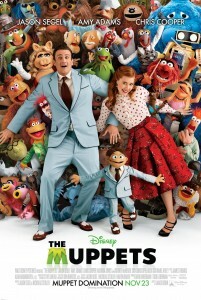 The story focuses on Segel’s character’s brother, Walter, a puppet and die-hard fan of the Muppets which were hugely popular in the 1970s. Now in 2011, the Muppets have disappeared and scattered across the states finding cheap venues to perform in. When Walter tours the run-down Muppet studio, he discovers the maniacal plot of a wealthy investor (Chris Cooper) to turn the studio into rubble and drill for oil on the property. Walter seeks out Kermit the Frog to regroup the old band once again and put a show together within a matter of days to save their contract by raising $10 million before they lose all rights to their studio. Much of the film builds up to the clan reuniting, showcasing a slew of celebrity cameo appearances. Witty zingers bounce off the walls. Outrageous musical numbers abound—chief among them Chris Cooper’s rapping and the chicken-ized version of Cee Lo Green’s ‘Forget You.’ This is all good fun. 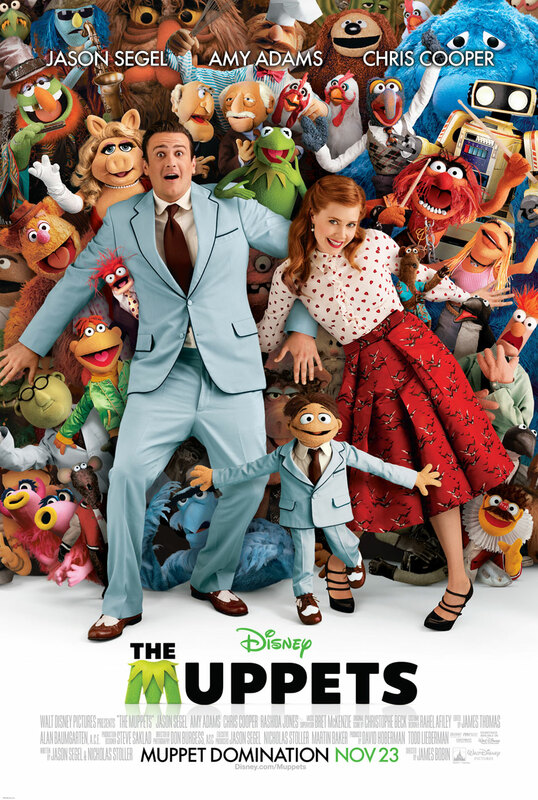 However, I wanted The Muppets to return loud and proud, and despite an admirable effort on the part of everyone involved, I can’t shake a slight feeling of being… underwhelmed. However, I enjoyed the film more often than not. It’s witty and clever in most of the right places. The film simply lead me on the entire time, as though it hinted that something big and amazing was about to happen, but never actually surfaced. Still, this is good fun for what it is and a welcome return for the Muppets. I never quite saw the lightning the first time around, but who could miss the rumbling thunder? 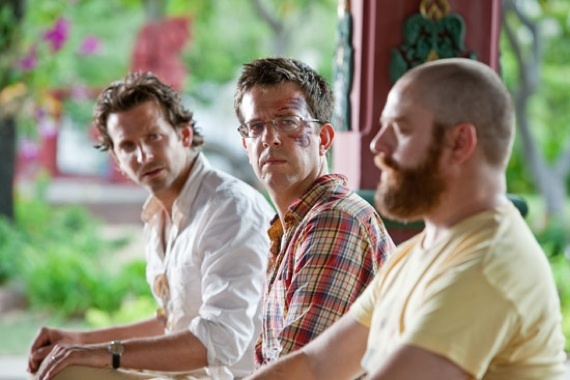 The Hangover storm raged over the summer of 2009, becoming the highest-grossing live-action comedy of all time, and later winning a Best Picture (Musical or Comedy) Golden Globe. A sequel was apparently in the works before the first film was even released. Unfortunately, as we all know too well, lightning rarely strikes twice. If a motion picture dictionary were to define the term ‘sequelitis,’ The Hangover Part II would be pictured alongside it. And that’s the least of the film’s problems. Perhaps I’m predisposed to loathe this sequel, and I will openly admit to that. While watching Part II, I remembered sitting in a History of Comedy class two years ago and the professor asked the students to list the five greatest comedies in film or television of all time. To my astonishment and complete disagreement, The Hangover swept the votes with nearly ¾ of the students naming it the funniest movie ever made. Say what? Obviously I missed the boat. 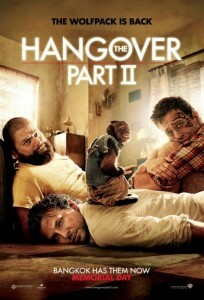 In my humble opinion, for every joke that the original Hangover hit spot-on, there was about ten that flopped. Audiences not digging Part I will certainly not have a change of heart with Part II. In fact, even if you enjoyed Part I, you will likely find yourself less satisfied this time out. The blueprint for this Hangover is nearly identical to the last. Expecting as much, I still found the movie to be a disappointment as a (keyword: funny) comedy. Stu (Ed Helms) is getting married in Bangkok to his beautiful young bride, Lauren (Jamie Chung). The entire wedding party and guests are being flown out to a resort in Thailand, including Phil (Bradley Cooper), Doug (Justin Bartha), and—regrettably for Stu—Alan (Zach Galifianakis). Phil convinces Stu to have one beer with the guys at a bonfire on the beach. One beer and some marshmallows later, fade to black. Phil, Stu, and Alan wake up in a dump hotel somewhere in Bangkok feeling foggy, looking disheveled, and presumably clueless. Alan’s head is bald. Stu has a Mike Tyson tattoo on his face. And a monkey is loose in the room. What’s worse? A severed finger revealed to belong to Lauren’s sixteen-year-old little brother Teddy (Mason Lee) has emerged. The guys have no idea what happened, and Teddy is nowhere to be found. It has happened again. Panicked and desperate, the Wolfpack runs wild through the streets of Bangkok piecing together the previous evening’s wild events in order to find their young missing companion. So… instead of Vegas we have Bangkok. A missing tooth is now a tattoo on the face. A tiger in the hotel has changed to a drug-dealing monkey. The baby has been replaced a by a silent monk in a wheelchair. Missing Doug is now missing Teddy. Stu’s female prostitute in Vegas has been exchanged for a transsexual prostitute. An annoying Asian mobster leaping out of the trunk of a car is now an annoying Asian mobster leaping out of a freezer. Sorry to spoil some of the events, but being that you’ve seen the first Hangover, you won’t be surprised by much of anything happening this time around. 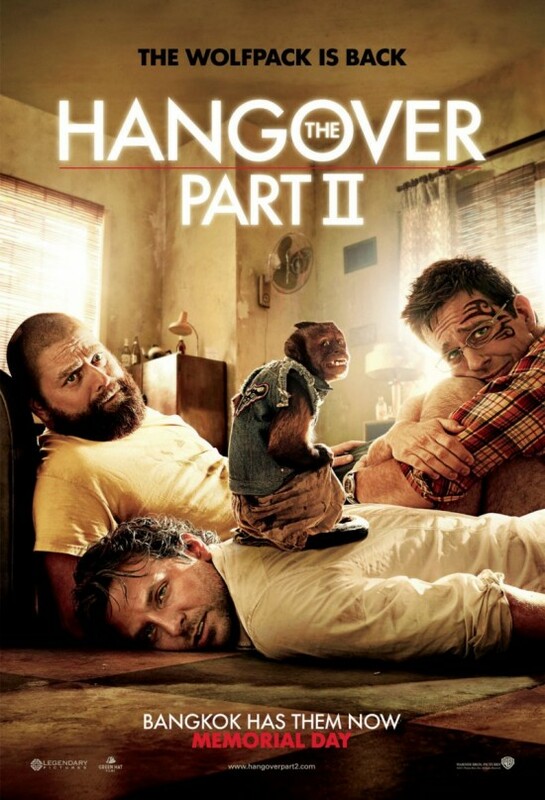 Hangover Part II simply does everything the first film does while lowering the bar on all counts. This one is darker and more twisted with absolutely nothing new to offer audiences. Shock has completely dominated over surprise this time, and for that very reason I found the film to be a near-total disaster. That being said, keep in mind the 2009 original did little for me. While I did find a few good laughs, overall I wasn’t a fan. Sticking close to what worked before, the three principal characters remain. The writers don’t even let Bartha’s character in on the mayhem again this time around—and he’s not even the missing friend. He soberly awaits the return of his friends back at the resort. At least his addition could have given viewers a change of pace. Since no character other than Alan is humorous, which is again the case, the film relies on outrageous situational comedy. 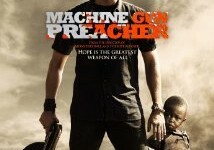 Unfortunately once again, most of the situations are violent and off-putting rather than clever and funny. Or maybe I just have no love for these characters and what they can never remember. For those with Hangover love, Hangover II will probably be another winner even if you don’t find it as funny as the first (which I can almost guarantee). No one involved in the sequel likely had the mindset they were topping the first picture. I’m sure tears of dollars signs were running down their joy-filled faces as they signed the dotted line for another greenlight. The script is plagued with flat-lined jokes that continued to fall well below the least common denominator while remaining tightly within the formula of Part I. If only the film would’ve been released in 3D… That way Alan could have leapt out of the screen and given me one of those marshmallows. Then I could wake up tomorrow morning without the slightest clue that I saw The Hangover Part II. Oh wait… who am I kidding? That would be straying too much from formula. When I saw the previews for director Todd Phillips’ Due Date, it looked pretty obvious what I was getting myself into. On the surface, Due Date appeared to be a 21st century reboot of the 1987 comedy, Planes, Trains, and Automobiles, starring Steve Martin and John Candy. Planes is a classic. Martin and Candy are comedic legends. Trying to update a great film (even if they aren’t explicit about it) is always tricky business and rarely a good idea. Still, the previews, the re-teaming of Zach Galifianakis and Phillips, and the inclusion of Iron Man sucked me into believing it would be worth seeing. Sure, Due Date was sure to have its quirks. But coming off Phillips’ surprise hit The Hangover, it didn’t seem reasonable to think with Downey Jr. on board Due Date wouldn’t be another pleasant surprise and a interesting twist on old favorite. Sigh. While premise wise Due Date is almost a carbon copy of Planes, Trains, and Automobiles, Due Date derails (sorry, had to use it) somewhere between Alabama and the Grand Canyon. To be fair, Due Date is not without its moments and Downey Jr. and Galifianakis do seem to have some comedic chemistry. Still, it seems most of the comedic set-ups and gags are wasted on the lowest common denominator, which becomes endlessly frustrating as the movie continues to develop. So many potentially hilarious moments are cut short or never develop at all just so that Galifianakis can do something completely over-the-top and bizarre. Sure, the thirteen year-old kid who snuck into the theater sitting behind me thought it was funny. But it’s not what I was hoping for. The movie’s most glaring flaw comes in the form of the relationship that develops between Downey Jr. and Galifianakis. In Planes, Trains, and Automobiles, Candy and Martin develop a friendship that comes across as heartfelt and genuine in the movies final scenes. In Due Date, the friendship between the movie’s two leads seems bizarre and forced. I’m still scratching my head as to why Downey Jr. ever develops any sort of affinity towards Galifianakis other than the periodic drug usage that occurs during the movie. Galifianakis comes across as so over-the-top and sometimes downright disgusting that there is no conceivable way anyone in their right mind would be able to put up with him for five minutes let alone five days. That’s what was so brilliant about Candy’s character in Plains, Trains, and Automobiles. He is an everyman, an annoying and attention starved everyman, but still an everyman. Candy strikes the right balance between endearing and irritating. Galifianakis leaves us only with absolutely strange to the point of ludicrous. In the end, Due Date was a serious let down. Sure, I laughed at times. But what could have been a nice update of a classic turned into a sophomoric affair. To say cheap gags and middle school boy humor abounds in this one is an understatement. This one might be worth a rental but definitely not worth the price of seeing it at your local megaplex. In fact, it might be more worth it to look up your local listings and see if the old John Candy and Steve Martin flick is on somewhere. It probably is, and it’s free and far more enjoyable. Jason Reitman is officially a brilliant filmmaker. After “Thank You For Smoking” and “Juno,” he delivers another surefire awards contender. His third film couldn’t be more timely, thought-provoking, darkly funny, challenging and heartbreaking. George Clooney has one of his best roles to date, and quite possibly delivers his best performance to date. He plays Ryan Bingham, a service-for-hire executive rented out by companies big and small to essentially terminate employees and save employers from growing a backbone. Bingham spends most of his time alone, flying all over the country and sleeping in hotels. His greatest ambition is to earn a record of ten million flier miles and earn himself a special name-tag. Life switches gears on him when his company hires a new gal (Anna Kendrick) to turn employee termination into a 5-minute private chatroom via the internet, saving the company all the travel expenses. Bingham objects to the idea and has to take the young graduate under his wing and demonstrate why he is so good at his work. 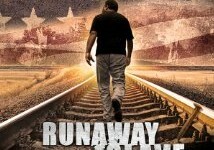 Along the way he meets Alex Goran (Vera Farmiga–The Departed), another executive with a similar lifestyle of constant travel, and potential romance ensues. I can’t stress enough how brilliant Clooney is in this film–able to evoke disdain and sympathy within a brisk 2 hours. Jason Reitman has penned his screenplay adaptation so strategically and carefully, and it really pays off. He has an ear for dialogue and an eye for his characters. Vera Farmiga and Anna Kendrick also deliver strongly in a film praised for great reason. 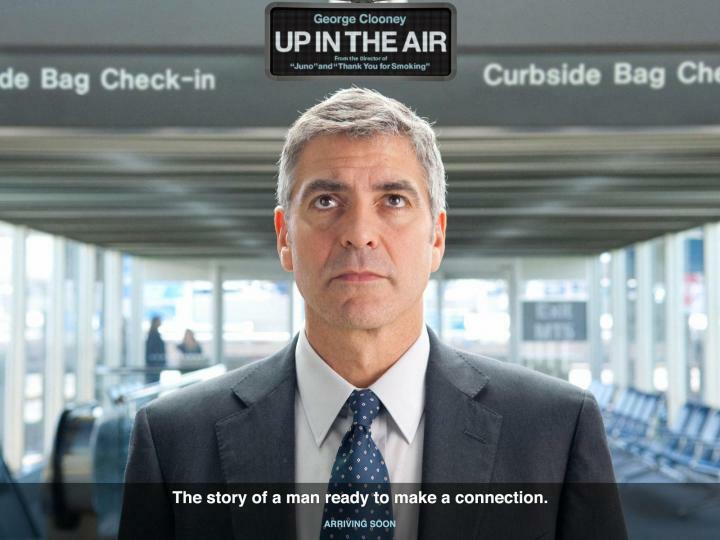 “Up in the Air” is a brilliant, airy, intelligent, and tragic film well worth seeing. The new year brought in a comedy that seemed destined for instant cult status, but instead Michael Cera (after that ‘Nick and Norah’ film I despised, and ‘Year One’ which I seemed to be the only one to marginally appreciate) delivers another crap-sack version of “Superbad” as the awkward hero desperate to lose his virginity. How to do so this time? Create an alternate persona known as Francois to be the dark and dangerous man he wants to be on the inside. “Youth in Revolt” is based on a book I haven’t read, and I can imagine it being a funny novel that fails to translate well onscreen. The film continually beat me over the head with its dull pacing, boring characters, uninteresting dual-personality plot device, and mean spirit. Enough of these teens trying to get laid, especially Michael Cera. The pacing is laborious, and nothing beyond what was shown in the redband trailer works for laughs in the slightest. I’ve always appreciated Cera’s knack for dry, awkward situational humor, but he wears incredibly thin in this film. It doesn’t help that eventually his character becomes so unlikable, and for a 90-minute movie that feels double its running time, this film has to be described as painful and uneven. Perhaps it will find its following on the small-screen, but I can’t get on that train. A fourth movie is reportedly in the works. There is no mention of the Sandman returning, thank goodness. The two most popular picks seem to be the Lizard and Carnage, although if the filmmakers can get the rights to the Kingpin from Fox, that wouldn’t be a bad move.